Rutigliano, A., Rutigliano and Renna. (2011). World Series. In L. Swayne & M. Dodds, Encyclopedia of sports management and marketing. [Online]. Thousand Oaks: Sage Publications. Available from: https://search.credoreference.com/content/topic/world_series_baseball [Accessed 25 April 2019]. Rutigliano, Aaron, et al. "World Series." Encyclopedia of Sports Management and Marketing, Linda Swayne, and Mark Dodds, Sage Publications, 1st edition, 2011. Credo Reference, https://search.credoreference.com/content/topic/world_series_baseball. Accessed 25 Apr. 2019. Annual baseball competition between the National League (NL) and American League (AL) champions. It is a best-of-seven series played each October. The first World Series was played in 1903 (as a best-of-nine series) and the AL's Boston Pilgrims defeated the NL's Pittsburgh Pirates in eight games. The World Series, or the October Classic, is the longest-running national American sports contest. The series has been played for more than 100 years, beginning in 1903. It has only been skipped twice, in 1904 because of a boycott and in 1994 because of a player strike. Before 1903, there was a championship for America's pastime but it went by different names and these series are not official recognized by Major League Baseball (MLB). In the late 1800s, some of these contests were the Championship of the United States, the World's Championship Series, and the World's Series. The National League (NL) has been the main surviving league and is still a circuit today in MLB; it wasn't until 1901 that the American League (AL) was formed as a second league. The AL and NL began to compete against each other in all aspects of the market. The first modern World Series was played between the Boston Americans from the AL and the Pittsburgh Pirates of the NL. The series was played out of nine games and won 5-3 by the Boston Americans. The current seven-game system was adopted in 1905, but was abandoned from 1919 to 1921, during which time a nine-game series was played. In its second year, 1904, the October Classic was cancelled because of a boycott by the New York Giants of the NL. The owner of the Giants, John T. Brush, did not want to compete against the inferior AL. The teams themselves were not inferior—Boston was the opponent and the defending champion—but Brush felt that the league itself was inferior because of a lack of rules. This incident caused Brush to take a considerable amount of criticism from the press, and as a result, he rescinded the boycott, but the Brush Rules were created and these regulations still govern the World Series today. Some of the regulations that the Brush Rules established had to do with which games' players receive money from ticket sales. In addition, it established who governs the series, which is the National Baseball Commission. This is important because the series was previously governed by the teams and could by changed at the whim of a team; the National Commission's governance allowed for consistency for every World Series. One of the darkest periods in baseball history was the 1919 fix of the World Series by the so-called Chicago “Black” Sox. During the 1919 season, there was record-setting attendance at many of the major league ballparks and the World Series was expected to generate over 50 percent more revenue than any series before it. This gave two devious men, William Thomas “Sleepy Bill” Burns and Bill Maharg, the idea to try to fix the World Series. “Sleepy Bill” had the connection to the players because he was a former pitcher, and Maharg was a gambler with connections to the underground—the two components necessary for a fix. Burns and Maharg first approached two White Sox players, pitcher Ed Cicotte and first baseman Arnold “Chick” Gandil. The players agreed to the fix, and went about recruiting six other players in order to make the scheme successful: pitcher Lefty Williams, center fielder Happy Felsch, shortstop Swede Risberg, third baseman Buck Weaver, utility player Fred McMullin, and one of the best and most popular stars ever, left fielder “Shoeless” Joe Jackson. With all eight players involved, the plan was quite costly. Burns and Maharg had to put up $100,000 for the players to split, which when broken down was about what they made in one year. Many more people became involved as a method of financing the plan, and thus more people knew what was taking place. This caused gambling lines to shift, with more people—a suspicious number—betting on Cincinnati to win the World Series. There are also claims that “Shoeless” Joe Jackson reported the fix to team officials. 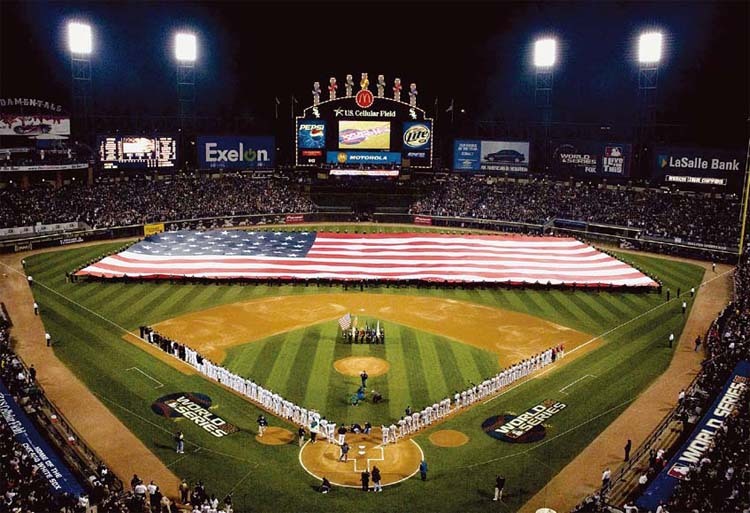 The singing of the National Anthem before the opening game of the 2005 World Series in Chicago, Illinois. The Chicago White Sox played the Houston Astros to win their first championship since 1917. Cincinnati won the nine-game series 5-3. Rumors and suspicion continued to spread, and the eight players involved in the fix were indicted late in 1920 and dubbed the “Black” Sox. One of the most interesting phenomena in baseball is the dominance of the New York Yankees over the World Series. The team has appeared in the series 40 times, slightly less than half of the total number of World Series, and has won it 27 times—a win percentage of almost 70 percent. The Yankees' dominance began when the team bought Babe Ruth from the Boston Red Sox in the off-season of 1919. This was the origin of the so-called “Curse of the Bambino” on the Boston Red Sox, who went through an 86-year period of not winning a World Series, which was broken in 2004 when the Red Sox beat the St. Louis Cardinals; ironically, the Red Sox beat the Yankees to get into that series. After New York acquired Babe Ruth, the team won its first championship in 1923. Over the next 86 years, the Yankees won 27 World Series, most recently in 2009. League Structure, Leagues, Major, Major League Baseball, Mega Sports Events. Acocella, N. History of a Dynasty. http://sports.espn.go.com/espn/classic/bio/news/story?page=New_York_Yankees (Accessed October 2010). Baseball Almanac. World Series: A Comprehensive History of the World Series. http://www.baseball-almanac.com/ws/wsmenu.shtml (Accessed October 2010). Everstine, E. W. 1919 World Series Black Sox Scandal. http://www.montgomerycollege.edu/Departments/hpolscrv/blacksox.htm (Accessed October 2010). Garza, G. History of the World Series. http://www.catalogs.com/info/sports/history-of-the-world-series.html (Accessed October 2010). Leventhal, Josh. The World Series: An Illustrated Encyclopedia. New York: Black Dog & Leventhal Publishers, 2001. Major League Baseball. World Series. http://mlb.mlb.com/mlb/ps/y2010/index.jsp (Accessed October 2010).